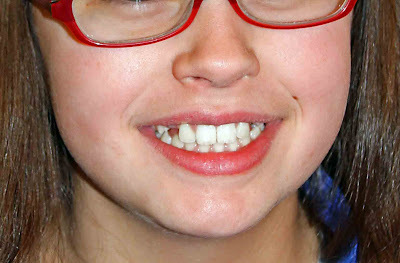 Wow- her teeth look awesome! I was thinking, "hey, that looks pretty good", then that Jack-O-Lantern almost made me jump out of my seat! Whoa! Both my kids would probably benefit from braces but they keep saying "no way" every time the dentist brings up the subject! 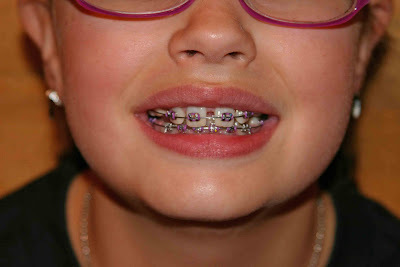 I'll show them your photos - shows how well braces work. 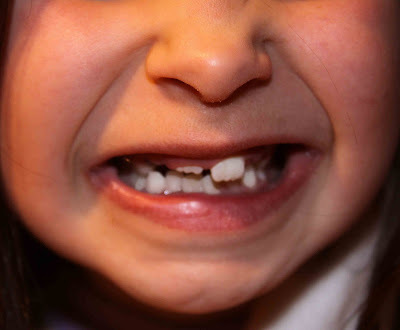 Isn't it ironic how the first set of baby teeth come in perfectly straight and pearly white, only to be replaced by a second set like that? I bet your oldest is really glad to be done with them! Oh boy! Nice! We have not started down that road yet, but we are getting buckled up for the ride. EEEEK. So much for college savings, might have to dip in a bit.